Iowa Car Seat Laws | Hupy and Abraham, S.C.
Are Your Children in the Right Car Seats? Iowa Code 321.446 makes it a simple misdemeanor to have a child who is not secured in a car seat as required by Iowa law travel in your car. Children under age one and weighing less than 20 pounds be secured in a rear-facing child safety seat. Children aged one to six must be secured in a child restraint system. This includes car seats and booster seats but does not include just a vehicle seat belt. Children aged six to eighteen may either use a child restraint system or a vehicle safety belt. All car seats and child restraint systems should be used according to the manufacturer’s directions and should be properly secured to the vehicle. While these are the legal guidelines in Iowa, the American Academy of Pediatrics recommends that infants and toddlers stay rear-facing until they are at least two years old. After that, the group recommends that children use a forward-facing car seat with a five-point harness for as long as possible, up to the highest height or weight allowed by the car seat’s manufacturer. Children who have outgrown a forward-facing car seat should use a belt-positioning booster seat until the vehicle seat belt fits properly. For most children, this occurs between the ages of 8 and 12, when they have reached a height of 4 feet 9 inches and can comfortably sit with their back against the vehicle seat back and their feet flat on the floor. In 2016—the most recent year for which statistics are available—the lives of 328 children under the age of five were saved by car seats. Car seat use reduces the risk of a child’s car accident injury by approximately 71 to 82 percent when compared to a seat belt alone. Booster seat use reduced the risk of a four to eight-year-old child’s car accident injury by approximately 45 percent when compared to seat belt use alone. When used correctly, car seats and booster seats protect your child from significant pain, life-long disability, and even death. Whichever car seat you buy will need to be installed properly so that it can protect your child. Car seats come with instructions, but you may still have questions. You can check out the car seat installation tips and videos on the National Highway Transportation Safety Administration’s (NHTSA) website, and you can have your car seat inspected by a certified car seat technician at your local police station or a car seat safety event. 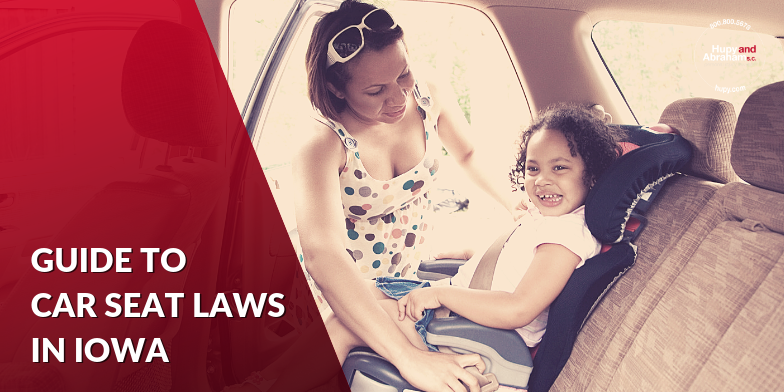 Car seat laws are not just helpful tips for drivers, and complying with Iowa car seat laws is about much more than avoiding a potential fine for violating the law. Instead, these laws are about protecting your child from injury or death in a car crash. Car seats effectively prevent many, but not all, accident injuries and fatalities. If your child is in a car accident, then you should make sure that your child gets prompt medical attention and follows the doctor’s recommended treatment plan. It is also important to replace the car seat that was in the car at the time of the crash with a new car seat to protect your child during future car rides. If you have any questions about what other steps to take after your child is hurt in a car crash, please start a live chat with us or call us at any time.